For 31 years, Geoff Guyton has pioneered the growth of technology in the Mississippi State University Extension Service. Geoff began working for Extension right after high school and continued until his retirement in 2012. Throughout this career, Geoff brought cutting-edge computer, networking, and software technology to Extension. He often worked behind the scenes, but his leadership and decisions have had a profound effect on the technology and communications systems throughout Extension. In 2009, Geoff was diagnosed with colon cancer. In 2011, Geoff’s cancer metastasized to his liver. In June 2012, Geoff retired from the Extension Service to concentrate on beating the cancer. But through it all, Geoff maintained a positive, upbeat attitude. 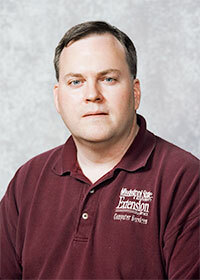 The Extension Center for Technology Outreach has created an award to honor Geoff’s dedication to the Extension Service. Each year, the award will grant a cash prize to an MSU Extension worker who has demonstrated innovative use of technology. Any Extension worker with at least a 50 percent appointment is eligible for the award by nomination or application. The Extension director will appoint a committee to choose the award recipient each year, and the award will be given at the annual Extension conference. An account has been set up with the Mississippi State University Foundation to create the Geoff Guyton Innovation in Technology Award. To fully endow the award requires $24,000. The MSU Foundation is a non-profit, 501 (c)(3) organization, and all contributions are 100 percent tax deductible. To donate to this fund, you may contribute a one-time gift or make a pledge over a five-year period. For your convenience, periodic contributions may be set up as a bank draft or credit card payment. Online contributions may be made through the Foundation website at http://www.msufoundation.com. For online contributions, choose gift type “Other” and designate “Geoff Guyton Innovation in Technology Award” the recipient of the gift.